Sorry, I don't know how to make braised meat look appetizing on camera, but here's hoping some oregano and lemon wedges go a long way to helping alleviate the brown of it all. Braised lamb! I obviously made this prior to my current #suitelife situation in Sydney, but damn if my mouth isn't watering looking at these photos. It could be because I'm starving after hours of ocean kayaking in the blazing sun and I haven't mustered the energy to call room service yet*, but I like to think it's also because this braised lamb was so very, very good. And inexpensive! Because that is the beauty of braising. You can start with a cheaper cut of meat, such as lamb shanks instead of leg of lamb, and if you treat it well with a good seasoning game and a gentle soak and steam in aromatic broth, you should end up with flavorful meat that is falling off the bone. 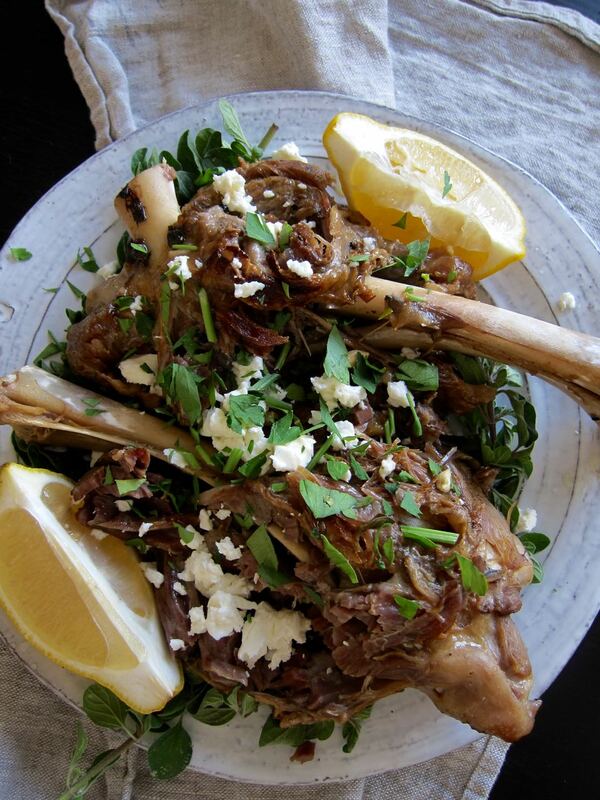 You can eat the lamb right after it's braised, scattered with feta and herbs and drizzled with braising liquid and a squeeze of lemon, which is lovely, or, you can hold on to your leftovers 'til Tuesday and I'll show you something fun to do with them! *Lest you think I'm humble bragging, you should know that I have NOT yet mastered my sunscreen strategy in a land with no ozone layer, and room service wine prices are basically highway robbery. Sprinkle lamb shanks with salt and chill up to overnight. In a dutch oven, heat oil over medium high heat and brown lamb shanks on all sides. This can take up to a half hour (cover with lid to avoid spattering). Sprinkle with more salt and fresh ground pepper while cooking. Lower the heat and add stock or water, lemon quarters, oregano, and garlic. Cover and simmer over low heat for 1 1/2-2 hours, turning shanks and adding any extra water as needed, 1/4 cup at a time. When meat is done, i.e. falling off the bones, remove shanks from pot, remove meat from the bones, drizzle with some of the braising liquid and garnish with feta and parsley, if using, as well as an extra squeeze or so of lemon. Serve immediately.